Making your own leaf rubbing is a great fall craft project that allows you to preserve memories of your fall trip to New England. When you find leaves that have scattered to the ground that are simply to pretty to perish, save them for rubbing. Collect as many beautiful fall leaves as you can find of all shapes and sizes as you explore New England. On a piece of plain white paper, position leaves vein side up in a pattern that you find pleasing. Lay another sheet of plain white paper over the top of the leaves, making sure the leaves underneath don't move around. Select the crayons you would like to use to create your leaf rubbing. Any color will work, but try to use fall colors like red, orange, yellow and gold. Peel off the paper wrappers, so you don't have to worry about them getting in the way. Turn a crayon on its side and gently rub over the top sheet of paper. Make sure you do your rubbing on a flat, hard surface, so the leaves won't slide around and the leaves' shapes will appear more distinct on the paper. The leaf images will magically appear on the paper! Experiment with different crayon colors and leaf arrangements to create one-of-a-kind leaf masterpieces. Be sure to bring along a plastic or paper bag on your New England fall rambles, so you can collect leaves for rubbings and not have to worry about dropping them. A bag also allows you to carry more leaves. The more you can collect, the better. The flatter the leaves are, the better. Leaves that have fallen recently are the best to use, but make sure they aren't wet. To keep the leaves from sliding around between the two sheets of paper, tape the leaves to the bottom paper. For more vibrant colors, try using oil pastels instead of crayons. Colored pencils work too. Share your rubbings with friends and family members who can't visit New England. They will love this autumn souvenir. You don't need to limit yourself to fall-colored creations. Go crazy! Try anything! Your leaf rubbing can be as unique as each leaf that falls in New England. Try making rubbings of flowers, ferns, twigs or feathers, too. Make leaf rubbings on large sheets of paper. Then, you can use your artwork as wrapping paper to add your own twist to gift giving. 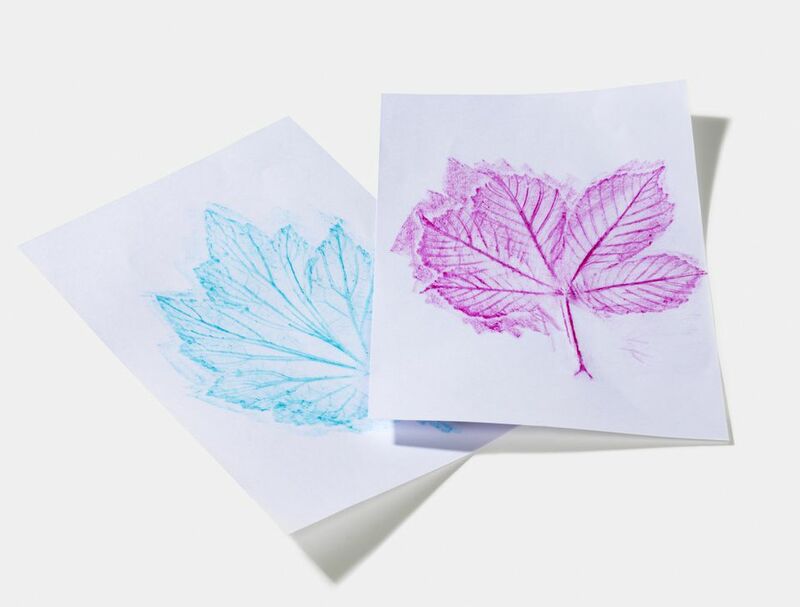 You can make leaf rubbings on blank note cards or stationery to send to people you are thinking of. Frame your artwork to display in your home.